The device has an easy-pour opening on the back of the unit, so you can pour chopped stuff without removing the lid or other disassembly. Blades are extremely sharp, so be careful with them. 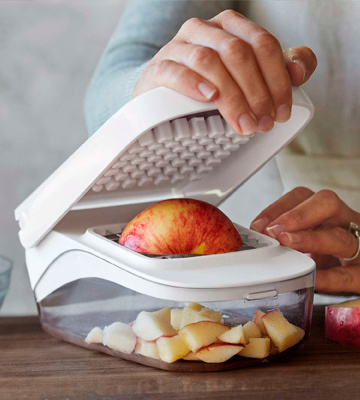 The OXO Good Grips is a functional onion chopper. It can cut pretty much everything and has a convenient design. Plus, it is equally easy to maintain and to use. The set includes 3 stainless steel blades of different size that allow you to make square cuts. 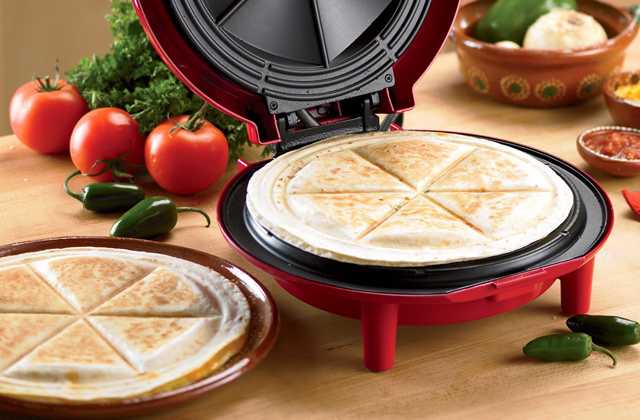 With this device, you can cut ingredients with different thickness neatly and make your dishes look amazing. Despite the recommendations, better wash it manually. 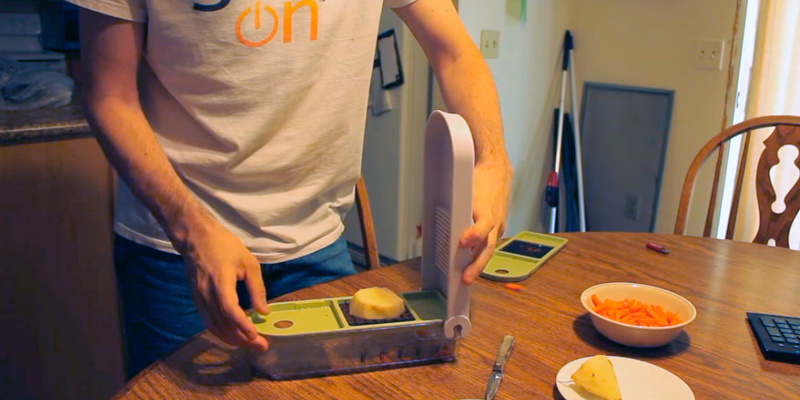 The Brieftons chopper is a simple-to-use device. 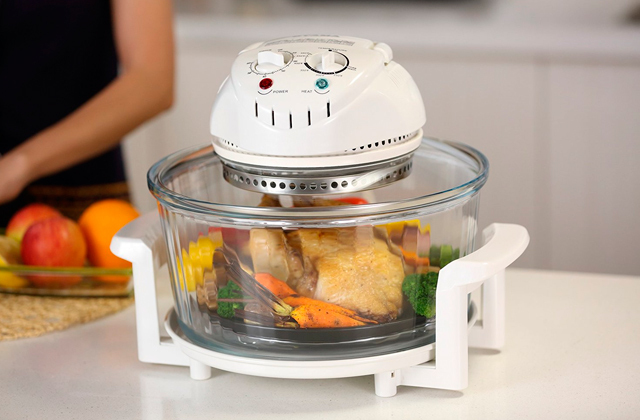 It has a capacious container and a special lid that will keep your ingredients fresh until your next cooking. This manual onion cutter is fitted with 2 blades for chopping and dicing. They both have a wide plastic base that allows you to set them safely. The cleaning tool is very fragile. The container can fit about 2 cups of chopped products which makes it compact and portable. You can take it with you on a picnic and finding a storage place in your kitchen won’t be a problem. 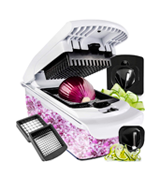 Apart from onions, you can also use this device for different ingredients like fruit, cheese and vegetables. There are 2 blades for dicing (large and small) and attachments for creating spirals and ribbons and decorating your dishes. The container could be sturdier. 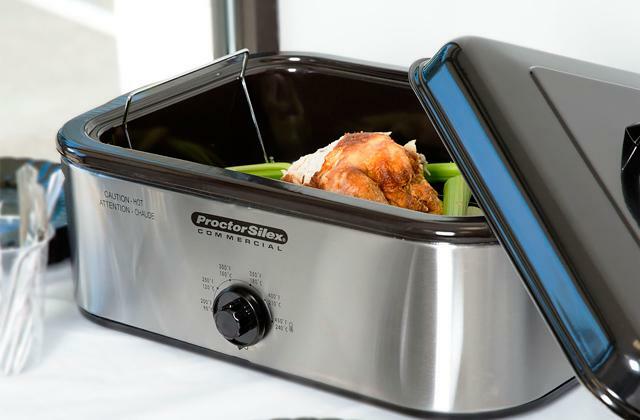 The Fullstar Slicer is a convenient device that will help you cook healthy and tasty food. It has an easy-to-grip rubberized handle that won’t allow your hand to slip while chopping. Unlike the other models, the blades of this device have a special locking mechanism, which makes use of the device very safe. The actual cutting area may be too small for some vegetables. The Bellemain is a simple tool for dicing onions and other stuff in cubes or julienne. 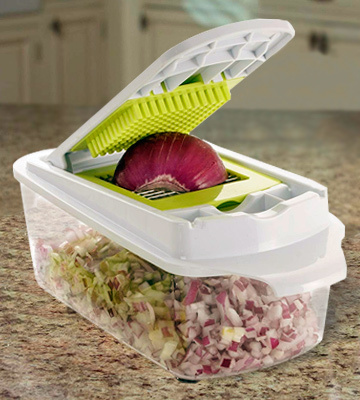 It has a 4-cup container and a Keep-fresh lid that ensures that the ingredients that were left after dicing won’t spoil. 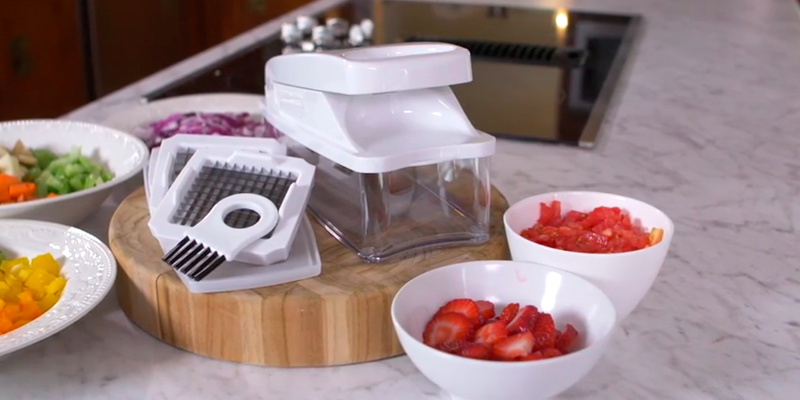 If you seek a functional addition to your kitchen, take a closer look at the OXO Chopper. There is almost nothing this device can’t chop. Apart from fruit and vegetables, this tool can easily deal with small stuff like garlic and nuts. 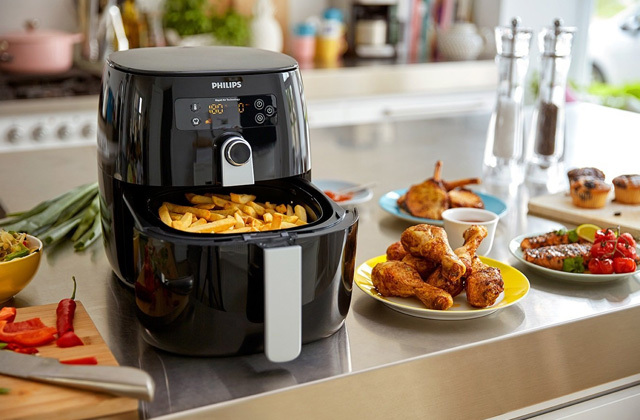 With this chopper, you will be able to chop and dice onions with no tears. It is fitted with sharp stainless steel blades and a moveable lid that allows getting the job done in seconds with a few simple moves. The container has a capacity of 2.5 cups, which is not very big, but thanks to the smart design you can easily empty it whenever it gets full. It has an easy-pour opening on the back of the unit, so you can pour chopped stuff without removing the lid or other disassembly. 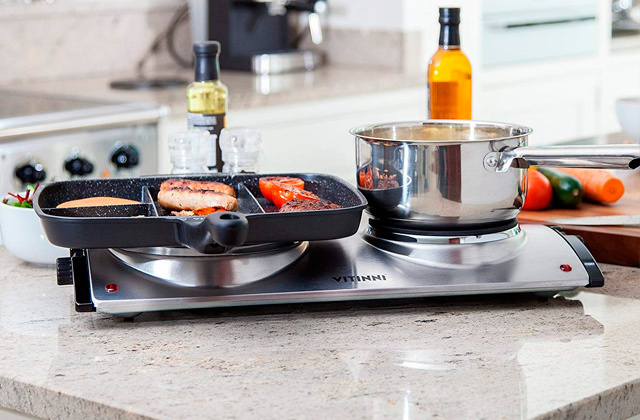 The device also has a non-skid base that ensures stability while chopping and protects your table and counter. Now let’s move on to the maintenance. The blades are very easy to clean. 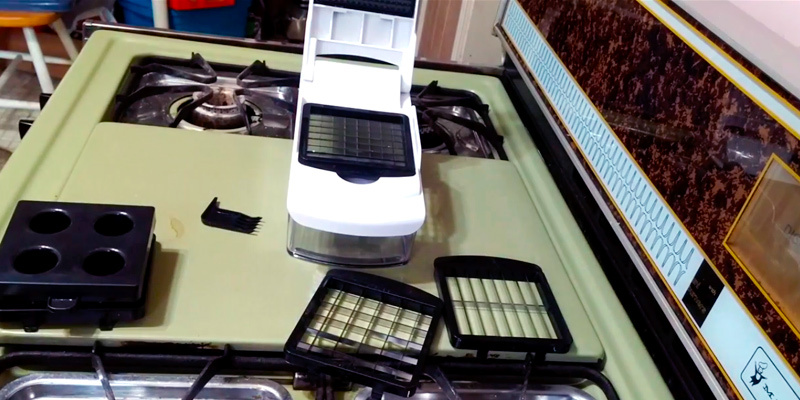 The device features a rubber grid that easily removes all the pieces that are stuck to the lid. The maintenance of the container is a breeze as well since it is dishwasher safe. As we already mentioned, the tool has very sharp blades. Some of the users say that they may be even too sharp. Hence, try to be extra careful with them in order not to cut yourself. To sum up, the OXO Good Grips is one of the best onion choppers you can find. It can cut pretty much everything and is super easy to clean. 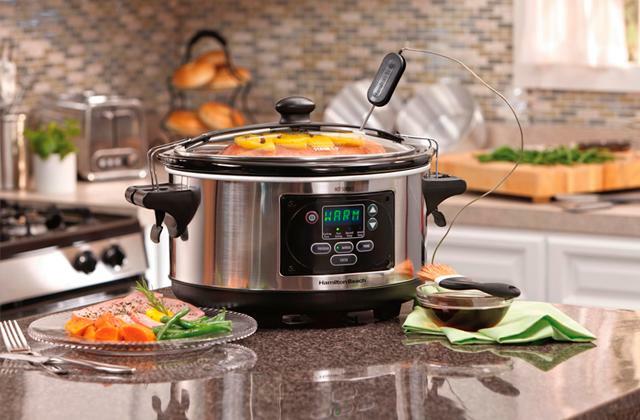 Brieftons cookware is designed for making your cooking process quicker and easier. This food chopper from this company is not an exception. 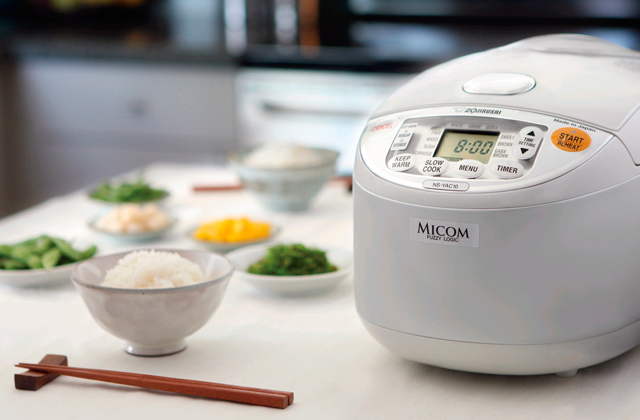 It will become a reliable assistant in your kitchen. The best thing about this product is that it is very easy to use. 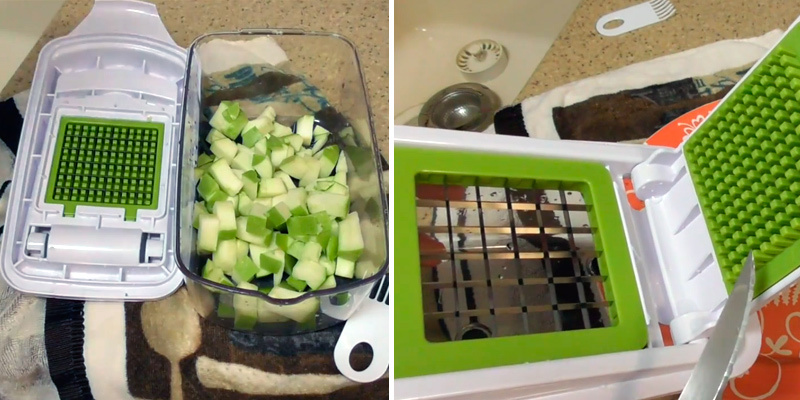 You can chop foodstuff in one quick motion by closing the lid. The container is pretty big and can accommodate around 8 cups. 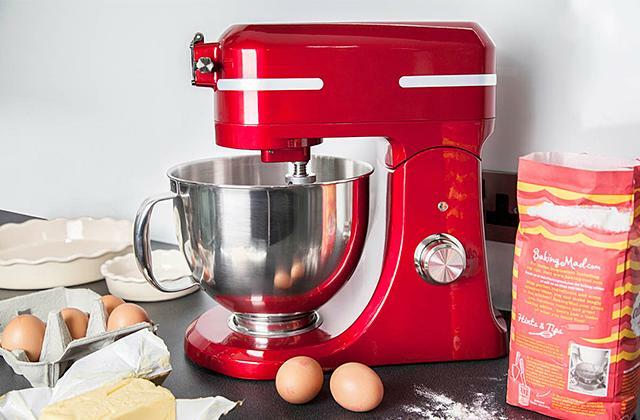 So, if you usually cook for a lot of people, this model is perfect for you. You can cut as much as you want and you won’t have to empty it very often. The manufacturer states that the container is top rack dishwasher safe, while hand washing is recommended. Yet, we strongly advise you to wash it manually if you want the cutter to serve you longer. Next, the set includes 3 stainless steel blades that allow you to make 0.25", 0.5" and 0.75" square cubes. 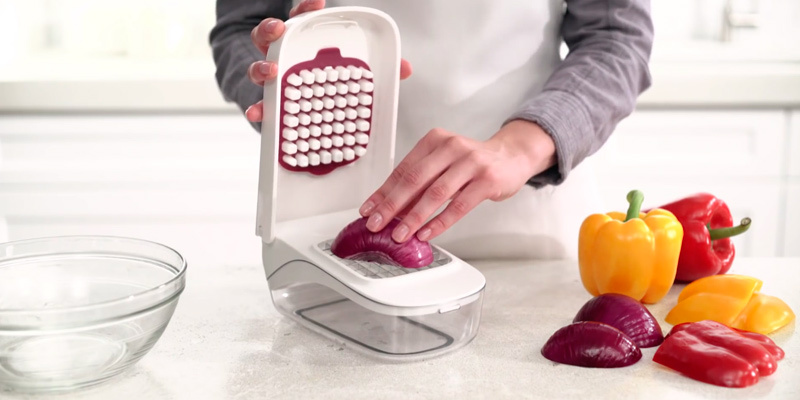 With this device, you can cut ingredients with different thickness neatly and make your dishes look amazing. If you need to chop hard skin fruit and veggies, it is recommended to peel the skin first so you will get the best results. Last but not least, the device comes with the Keep-fresh lid. If you chop too many ingredients, you can put them in the fridge in a container and use them next time you cook. For all those who need a simple-in-use yet capacious food chopper, this device from Brieftons is the best pick. It will help you create cubes of different sizes in the blink of an eye. 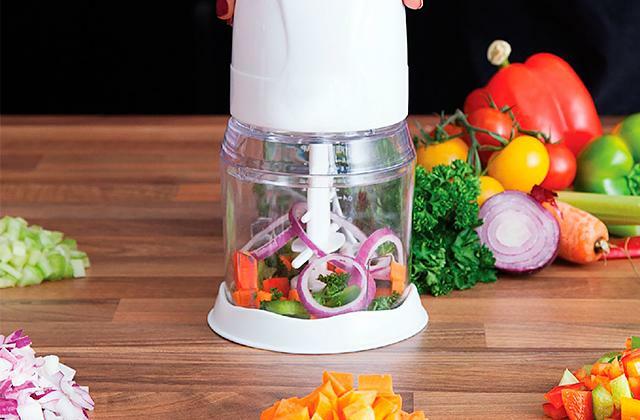 To make your kitchen tasks quick and simple, the Original Vidalia Food Chopper from Chop Wizard is a must-have. 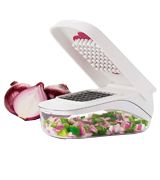 This manual onion cutter is fitted with 2 blades for chopping and dicing. They both have a wide plastic base that allows you to set them safely. A lot of users also point out how convenient the container is. If you need strict measuring for your recipe, with this tool you won’t need an extra measuring cup since the container can act like one. The dicer has a measuring scale on the side. The container can fit about 2 cups of chopped products which makes it compact and portable. You can even take it with you on a picnic. Plus, finding a storage place in your kitchen won’t be a problem. The main con of this set is that the cleaning tool is pretty fragile. However, we wouldn’t consider it a major problem since you can clean it with the cleaning utensils you’ve got. 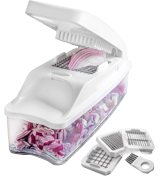 What is more, the dicer is dishwasher safe, so if you own a dishwashing machine, you can clean this device in it. And if you are in search of it, you may want to check our list of best dishwashers. 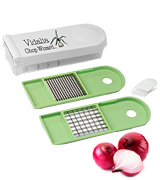 To sum up, the Original Vidalia Food Chopper is a decent option for your kitchen. It is safe to use and thanks to the small size, it is easy to carry around. 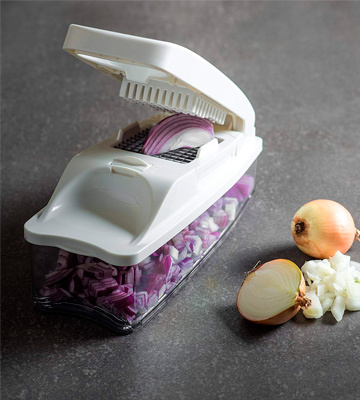 This Fullstar Onion Chopper is a functional tool for cutting onions without any tears that can compete with some commercial choppers in versatility. 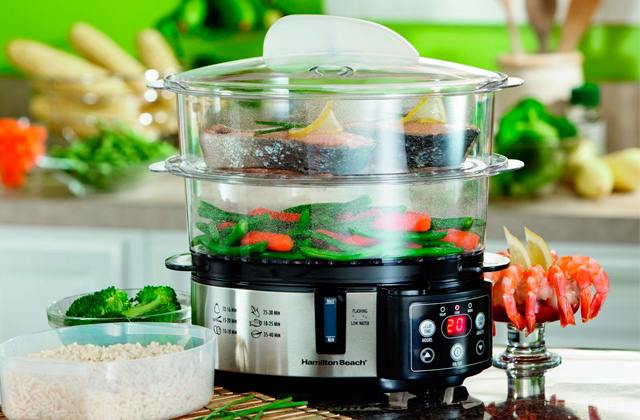 To begin with, this device is designed to make the chopping process as quick and comfortable as possible. It is fitted with an easy-to-grip rubberized handle. 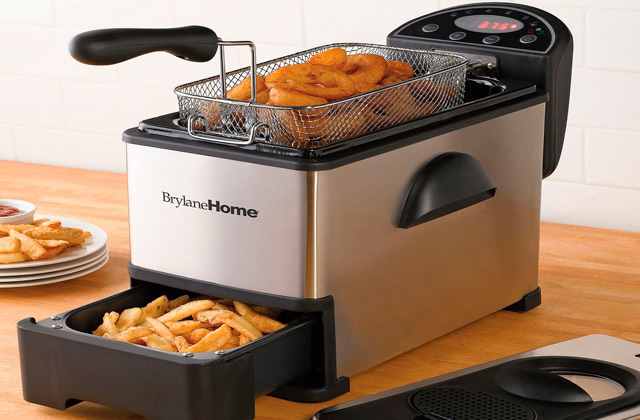 It won’t allow your hand to slip while you chop. To start dicing, you just need to close and open the lid. The unit is also fitted with non-skid feet that provide extra stability. This manual slicer includes 4 different blades in a set. 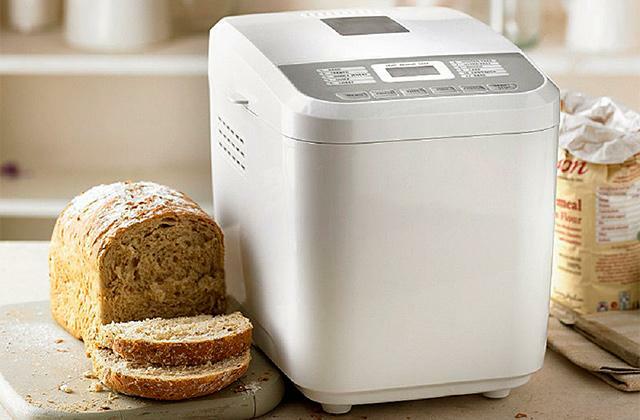 Apart from onion, you can also use this device for different foodstuffs like fruit, cheese and vegetables. There are 2 blades for dicing (big and small) and attachments for creating spirals and ribbons. With this tool, you can decorate your dishes and make them look like they were cooked by chefs in a restaurant. By the way, the blades are made of 420-grade stainless steel which makes them extra robust and rust resistant. As for the container, it is made of BPA-plastic. It is stated to be top-rack dishwasher safe, yet some users point out that it is pretty fragile. So try to be a bit more careful with it. 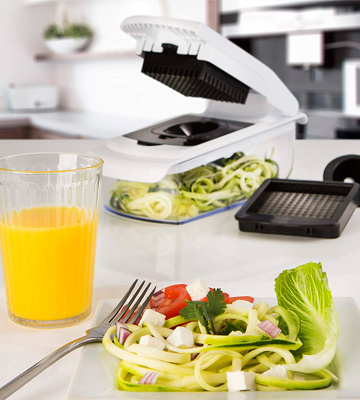 The Fullstar Slicer is a convenient device that will help you cook healthy and tasty food. It has an easy-to-grip rubberized handle and non-skid fit make a chopping process a breeze. 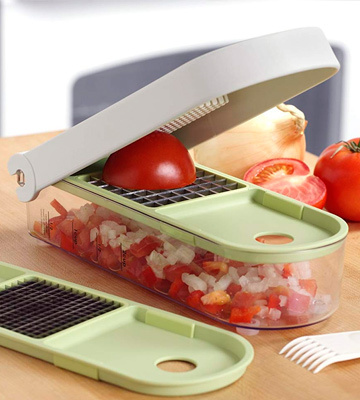 If you are looking for a simple yet efficient food chopper, this model from Bellemain will fit you. It offers you 3 cutting options: there are blades for 0.2” and 0.5” dicing and making 0.25” julienne. Also, unlike the other models, the blades of this device have a special locking mechanism, which makes the use very safe. Unfortunately, the actual cutting area is a bit too small for some fruit and vegetables. To dice them efficiently, it is recommended to cut them in smaller pieces in advance, which will take you only mere seconds. Hence, we hope, this minor inconvenience won’t make a big difference for you. The 4-cup container comes with a Keep-fresh lid, which ensures that the ingredients that were left after dicing won’t spoil. The other convenient extra feature is non-skid feed that makes dicing process more comfortable. The set includes a cleaning brush for easy maintenance and this model is dishwasher safe as well. It is also worth mentioning that the chopper comes with a 2-year warranty, which makes this product a worthy investment. 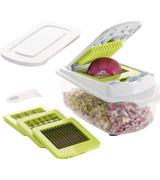 All in all, the Bellamail Onion Chopper is a basic model that allows you to chop onions and other stuff in cubes or julienne quickly and efficiently. What Is an Onion Chopper? We love adding onions to most of our meals to intensify the taste of the main ingredients or to make the flavor of the meal more complex. Onions are also beneficial for our health since they contain a lot of vitamin C. However, preparing onions can be a real pain in the neck since the fumes from a cut onion irritate our eyes and even the toughest of us can find ourselves sobbing. In order to avoid that, we recommend purchasing an onion cutter. An onion chopper is a simple device that will not only spare you from tears but also make cutting significantly quicker and easier. There are many types of onion choppers available on the market. You can find electric and manual models and they may come in different shapes, sizes, and designs. Also, they may include a different number of knives and blades for cutting various ingredients and can be made using different materials, which you can judge from the price. Yet, no matter what type of an onion chopper you choose, you're sure to take advantage of its versatility since they can serve for many more tasks beyond simply chopping onions. While searching for an onion chopper, you might also want to read our reviews dedicated to slicers and meat grinders.